Marmalade made from tender leaves of peepal tree provides vitality and strength to the body. Consuming the marmalade removes many heat related diseases.This also cleanses the kidney and allows urination without obstruction.Excessive burning of eyes due to pitta can also be treated using this marmalade.This is beneficial in pregnancy & menstrual related issues.Consuming this negates any fear of miscarriage. One must never pluck leaves from peepal tree casually.First pray to peepal God," Oh,Lord I am using this for medicinal purposes,Please bless us".One must never cut a peepal tree as holy God element resides in it. 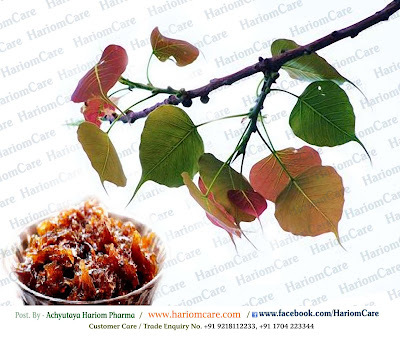 Wash thoroughly 250 grams of tender red leaves of peepal tree and boil them in water. Then grind this and add equal proportion of candied sugar (khadi sakar) and 50 gms of native cow(not the hybrid ones) ghee,then put this on slow heat. Once the mixture becomes dense ,cool the mixture and store it in a sealed container (glass container is ideal). Take 10-10 grams of this marmalade everyday in the morning and evening with milk. 10 to 12 grams of tender peepal leaves extract and 1/4 th spoon powdered candied sugar(khadi sakar) to be taken in the morning & evening. This makes the heart strong ,there will be no heart failures(heart attacks),this is also beneficial in the conditions like epilepsy & fits.
. ऑनलाइन खरीदने हेतु www.ashramestore.com पर जाये To Purchase Online, Visit : www.ashramestore.com . किस समय उठने से आपकी उम्र हो जाएगी 100 साल ! 1 बाल्टी पानी में 4 चम्मच नमक...फिर देखो कमाल ! बालों के झडऩे की समस्या.. ????????? ?? ????? ???? ??-?? ?? ????? ?